If I already have the TK RapidMask 2 is there a good reason why I would want this version? Jerry–While the RapidMask2 panel does everything the Basic V6 panel can do, by signing up for the Basic V6 and confirming your subscription you’ll be added to the list to receive updates and discounts in the future. It’s entirely up to you, though. I’ll likely send similar update information to regular customers as well. 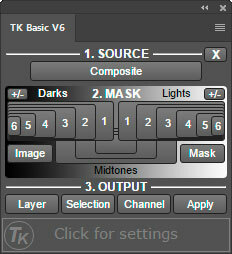 Tom–The Basic V6 is indeed a “beginners” panel and is not meant to replace the RapidMask2. I’ll update the blog to reflect that. Thanks. Thank you very much Tony Kuyper for this tool. Muchas gracias Tony Kuyper por esta herramienta.